I work hard to keep the level of service and hairdressing I offer, as high as possible. Moreover, the level of my of experience means that I can call upon every effective cutting technique used since the mid-1970’s. This was the period when precision hair cutting was first developed by the best hairdressers in Manchester at Vidal Sassoon company and I was fortunate to be at the forefront of this technique alongside some of the most creative and talented hairdressers around. Precision haircutting came into being as a result of the availability of extremely sharp Japanese scissors. Before this, hairdressing scissors were low-grade and needed to be sharpened every couple of weeks. The sharpening process used was to grind the edge of the blade with a rough sharpening wheel; this combined with lower quality steel produced an inferior edge which dulled very quickly giving a rough finish to the cut hair. By contrast, the Japanese scissors were made of Sand Iron, the same steel used to make Samurai swords, the blades were honed by hand to a very precise and clean edge which remained razor-sharp for anything up to a year. Although scissor technology has since improved, relatively few hairdressers invest in the better Japanese scissors, opting for cheaper, second-rate scissors. The precision technique is based on the concept that the hair is cut in such a way as to enhance and complement the customer’s bone structure and hair texture, using the hair’s natural movement. The haircut must be executed precisely enough so that the hair can be controlled and recreated easily by the customer at home. This is achieved by balancing the shape of the cheekbones, jawline and the overall head shape with the angles that are cut and the amount of weight positioned in complementary areas around the outline and internal areas of the cut. When executed correctly the hair will fall into place with little effort. 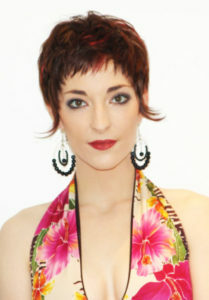 Precision cutting works best on short hair, where interesting and striking designs can be achieved. With longer hair, a precisely cut line will swing back into shape after the hair moves. The excessive blow drying that certain “Celebrity Hairdressers” promoted during the late 1980’s and early 1990’s coupled with the increase in women growing their hair below shoulder length caused precision cutting to all but disappear. There are now fewer stylists who can successfully execute these precision cutting techniques. This is mainly because many of those involved in the original development of the technique have retired and their skills were not passed on. The trend for women to have long hair and the reluctance of some hairdressers to invest in the best tools means that the stylists able to provide the precision cutting skills today tend to be the older more established stylists with many years of varied experience.